The Z3 was an electromechanical computer designed by Konrad Zuse. 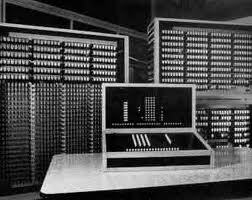 It was the world's first working programmable, fully automatic computing machine. It was Turing-complete, and by modern standards the Z3 was one of the first machines that could be considered a complete computing machine, although it lacked the conditional branch operation. The Z3 was built with 2,000 relays, implementing a 22 bit word length that operated at a clock frequency of about 5–10 Hz.